Community paramedicine (CP) is an innovative and evolving model of community-based healthcare designed to provide more effective and efficient services at a lower cost. Community paramedicine allows paramedics to function outside their traditional emergency response and transport roles to help facilitate more appropriate use of emergency care resources while enhancing access to primary care for medically underserved populations. A community paramedic (CP) is an advanced paramedic that works to increase access to primary and preventive care and decrease use of emergency departments, which in turn decreases health care costs. CPs are not meant to supersede or replace any healthcare programs that are already available in the community, rather they supplement and enhance these programs. Operate under medical control as part of an organized-system approach to patient care. Does my community have community paramedicine? There are many community paramedicine programs throughout California. EMSA, in partnership with the California Health Care Foundation (CHCF), is conducting a pilot study in dozens of California locations. The projects focus on providing services where access to healthcare is limited or when a short-term intervention is needed. Future locations may open if California adopts community paramedicine following the end of the pilot study. To date the CP pilot study has seen over 4,300 patients and is estimated to have reduced medical costs in excess of $3 million, proving the effectiveness and safety of the community paramedicine models (2019 CP Evaluation). What is the history of community paramedicine in California? In 2014 the Office of Statewide Health Planning and Development’s (OSHPD) Health Workforce Pilot Project Program temporarily waived sections of the Health and Safety Code and approved the CP pilot study. Previously paramedics were unable to work in any setting other than at the scene of an emergency or while transporting patients. OSHPD’s approval allowed EMSA to test the effectiveness and safety of community paramedicine. Recently OSHPD reapproved EMSA’s pilot study through November 2019 which included the addition of four (4) new sites. The goal of the post discharge project concept is to avoid unnecessary EMS transports, ED visits, and hospital readmissions. 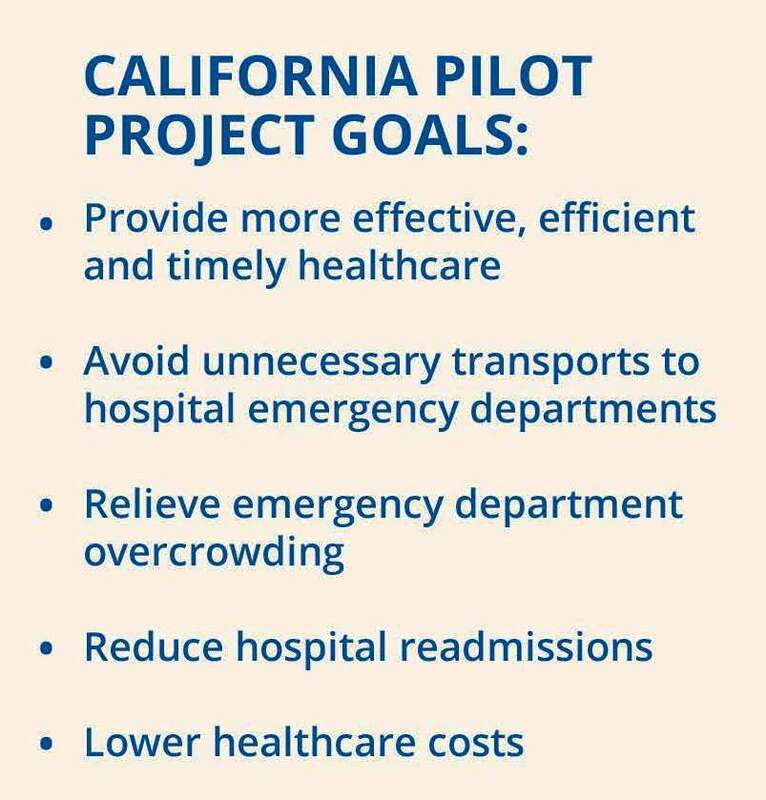 The goals of the alternate destination project concept are to relieve emergency room overcrowding, reduce costs, transport patients to care sites appropriate to meet their needs, and increase emergency services availability and options for the community. The goals of the frequent 911 project concept are to connect frequent 911 callers with services best able to address their needs, reduce costs, and reduce burdens on EDs from patients whose needs are better served by non-emergency aspects of health care or by the social system. The goal of the hospice project concept is to provide hospice patients with the medical care and the support necessary to remain in their location of choice, rather than being transported to an emergency medical facility. The goal of the public health collaboration project concept is to provide more efficient and effective healthcare of TB patients by partnering specially trained Community Paramedics with public health department case workers. The goals of the behavioral health project concept are to provide behavioral health patients with the most effective, efficient and timely care possible, ease ED overcrowding, reduce the number of patient transfers, and lower hospital and EMS system costs. The goals of the Sobering Center project concept are to provide patients with the most effective, efficient and timely care possible, ease ED overcrowding, reduce the number of patient transfers, and lower hospital and EMS system costs. By taking patients to the most appropriate facility for care. 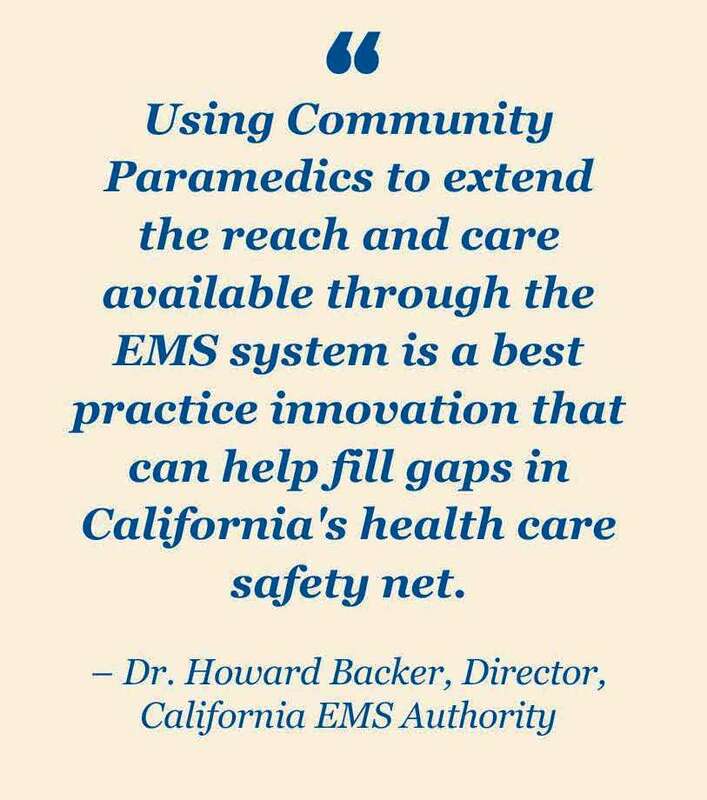 Evaluation of California’s Community Paramedicine Pilot Project. The Healthforce Center at UCSF has published this comprehensive independent evaluation of California’s Community Paramedicine pilot study. Community Paramedicine: A promising Model for integrating Emergency and Primary Care (July 2013). UC Davis Institute for Population Health and Improvement, with funding from the California HealthCare Foundation, published this report to examine the potential policy options for Community Paramedicine in California. National Consensus Conference on Community Paramedicine: Summary of an Expert Meeting. Community Paramedic CORE Education Program.